‘Caught between a rock and a hard place’ – we’ve all heard the metaphor at some point in our lives. Usually, it is adopted at a moment of indecisiveness or prevarication. For some of people, the phrase may even define their personality. But in July 2003, Aron Ralston discovered its literal meaning and 127 Hours brings to light his remarkable story in great detail. Aron, played by James Franco, enjoying a stroll in the Grand Canyon. Little does he know that a slight loss of balance is going to change his life forever. 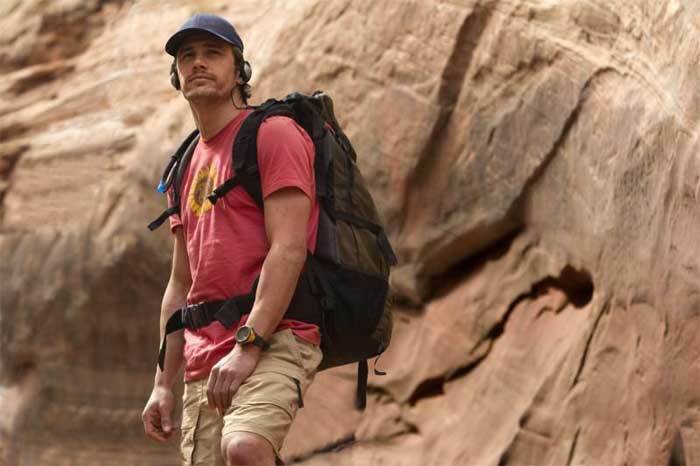 In the summer heat, Aron Ralston (James Franco – Spiderman I, II & III, Your Highness) goes for a cycle and a hike in the Grand Canyon. Since Aron is a guide, he knows the terrain well. He climbs, jumps and walks around as if he owns the place until a small slip sends him tumbling several metres down a narrow gap in the ground. Worse, a boulder falls with Aron and virtually cements his arm between it and the rocky wall. Aron is stuck and very-much alone. He has little food and water, and no means of contacting the outside world. For one hundred and twenty-seven hours (over five days), Aron remains there until the fear of death forces him to make the painful sacrifice of cutting off his trapped arm with a mere pen-knife (and no anaesthetic!) so as to carry on living. The plot may sound uneventful as more than an hour of the film is based round a man stuck in a still, but frightening situation. Yet, that is far from true. One watches with anticipation what Aron will do in an attempt to move the bolder. Indeed, some of the innovations he comes up with are very intelligent. That he does these things without the use of a hand makes them all the more impressive. However, 127 Hours would not be half as decent if it were not for James Franco. Franco illustrates here that he has matured as an actor since his semi-pitiful displays in the Spiderman movies. In this film, it is almost solely up to him to keep the audience stimulated for over ninety minutes, and he easily achieves this. Franco superbly portrays Aron before and, especially, after the fall. The all-too-real look of horror in his eyes when he initially realises the depth of his predicament is one that few will forget in a hurry. The different stages he goes through, before doing the unthinkable, are also very interesting. Franco’s performance is utterly realistic and the tribute for giving him this platform must go to the director, Danny Boyle (Slumdog Millionaire, The Beach, Trance). One scene in particular, although gory to the point of making one want to vomit (unless one is used to watching the Saw series), is done exceptionally well and with graphic detail. Aron feeling down and helpess as he can’t move the boulder that has trapped his right arm. Yet, Boyle also lets himself down a bit. One needs to be brave to make a film like this (especially if he/she wants to make a handsome profit); but, unfortunately, Boyle lacked the courage of Rodrigo Cortés, the director of Buried (which is literally about Ryan Reynolds in a coffin for ninety-odd minutes with a lighter and a mobile phone.) By putting in music and other noises whilst Aron is jammed, Boyle takes away some of the realism in 127 Hours because this would not have happened. Another criticism of the movie is that one never gets a sense of just how long, boring and lonely it must have been for Aron during those one hundred and twenty-seven hours. One may see the sun rise and fall a few times, or watch Aron gradually run out of water or reminisce over and over again about the mistakes he’s made in his life; but this only captures the length of time he was stuck there for on a superficial level. Nevertheless, despite these flaws, 127 Hours is entertaining and Franco’s acting fully justifies the nominations that he’s been lined up for. The movie is also truthful and has a nice pseudo-religious dimension to it. Above-all, 127 Hours shows us that, even when caught between a rock and a hard place, mankind’s resilience is extraordinary. This entry was posted in Based on Real Events, Horror and tagged 127 hours, alone, buried, caught between a rock and a hard place, danny boyle, film, james franco, mountain climbing, review, reviews, ryan reynolds, spiderman, your highness. Bookmark the permalink. Never, never never hike alone. That is definitely one of the morals of the story.